This is SUCH a busy week! My friend Carla is here and she's about 6 months along. So given that I completely adore her we set up tons of time for hang outs but we also did her maternity photo shoot! Eeep! It was F&O's very first one so I'm way pumped that it was with Carla! I wanted to share a few of my favorite edits so far! OH! I'm so in love with these so far! There will be more as I continue to edit and sort. I'll be posting more on our photography blog :] I'm also making her an owl for her baby shower - sshhhh it's a secret! But, I think it will be the cutest one ever! 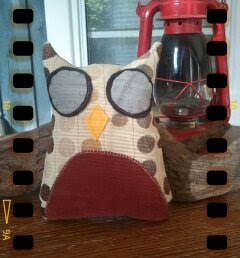 Speaking of owls I'm giving one away on with Kam from Campfire Chic! It's the owl I shared with you a while back, with a red belly and polkadots! SO cute! You can check it out by clicking the link above. Ugh, I'm sorry I STILL don't have a better photo of this wee one! Quick side note... Angus hopped in the living room window today and brought me like, 4 leaves. It was the cutest thing in the world. I'm off to having coffee with another sweet friend! Happy Tuesday! she looks so beautiful! if i could i would totally have you do some maternity pictures for me! the pictures look fabulous! i can't wait to see more. <3 super cute owl!! the first picture is so beautiful! great job sweetie! cute cute cute belly pics!! !